Folders are a way to group sub-calendars and to create an organizational hierarchy for them. Folder organization makes it easier to find the sub-calendars you are looking for, or to work with only a group of sub-calendars. Sub-calendars are indented inside folders. The folders have a gray color bar to set them apart from the color-coded sub-calendars. To create sub-calendars inside of a folder, simply use a right arrow symbol in this format: Name of Folder > Name of Sub-Calendar. For every sub-calendar you want in the folder, use the same format and the same folder name. You can create nested folders, as well, using the same concept: Folder 1 > Folder 2 > Sub-Calendar. 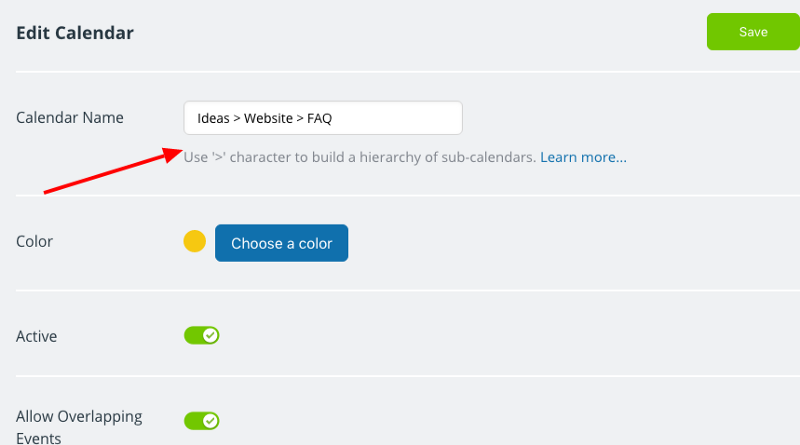 You can nest folders and sub-calendars in your organization. 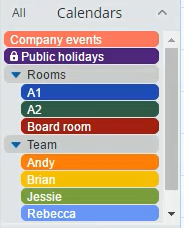 You can work with folders to easily view a group of sub-calendars, or toggle all the contents of a folder on or off. Click the arrow to open or close the folder. 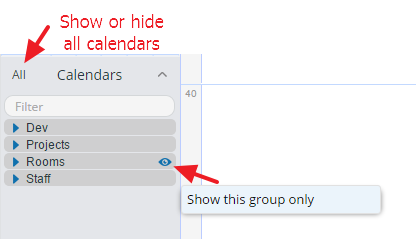 Click the eye icon on a folder to show only the group of calendars within it. You can open or close folders. To remove a sub-calendar from a folder, alter the name of the sub-calendar by removing the Name of Folder > from it. Instead of Name of Folder > Name of Sub-Calendar, you will have only Name of Sub-Calendar. « What is the event editor?